Also known as additive manufacturing, three-dimensional printing is the process of producing physical, real-world objects from a digital 3D model on a computer. 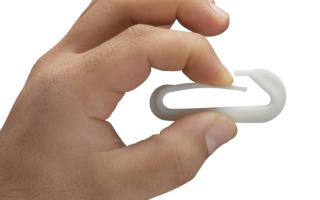 The applications and potential uses of 3D printing are endless, and this exciting technology is rapidly advancing. 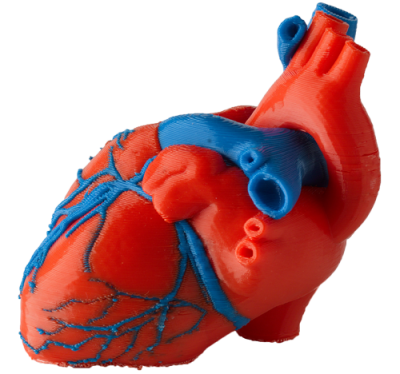 The quality, detail and strength of a 3D printed model varies widely based on the type of printer and kind of materials used. These days it is possible to print simple items yourself with a desktop 3D printer, but for the superior quality and higher resolution models it is necessary to make use of professional, industrial grade printers, which is where a company like 3D Printing Ireland comes it. Not only do we provide a selection of cutting edge printing options, but our expertise and experience will ensure that the highest quality and accuracy is achieved. At the same time we work towards to minimise the overall material and time costs, in order to provide the best value possible for our customers. Read on below to learn about the 3D printing process and our available printer types. Every 3D printer requires a 3D digital model to use as its “blueprint” of what it will produce. These digital models can be created in a range of CAD and 3D design software packages, or directly from 3D scanning and photograph data. Before a 3D file can be printed it needs to undergo a process to ensure it is “Print Ready”. This includes finding and repairing any errors in the mesh, such as holes, inverted face normals, or overlapping parts of the mesh. A well made and clean 3D model will minimise the time necessary to fix it up to a printable standard. 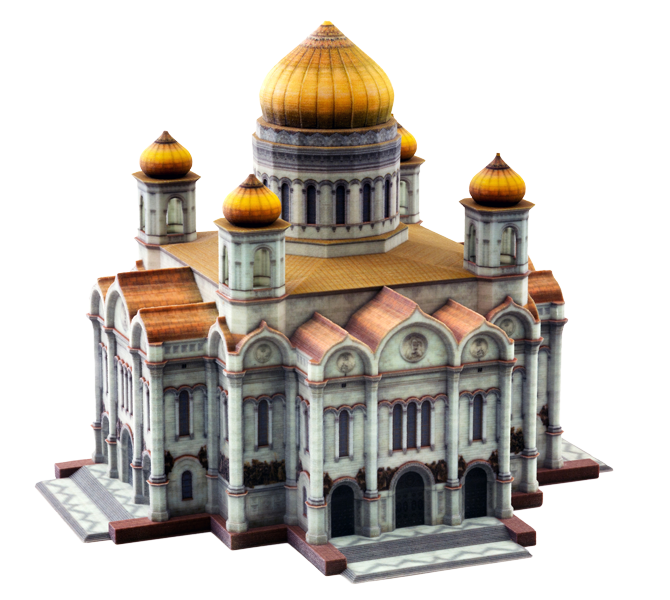 The 3D digital model can now be sent to the printing software, in the form of a STL file. Here options regarding wall thickness, divides, escape holes, support structure, and colour are determined. Once this is all completed, it is possible to determine the total cost of material s and the print time, so pricing for the job can be accurately established before printing begins. When everything has been checked, the file is sent to the prepared 3D printer. The total printing time of a 3D model will vary depending on factors such as the thickness, overall size, complexity of the model, as well the type of printer and material being used. The duration of the fabrication process can vary from a few hours, to a few days. Usually when a print has been completed there is still some manual post-processing required, the extend of which differ depending on the printing technique and materials used. For example, in FDM printing it is often necessary to add supports to the model to allow the printing of overhanging geometry. These supports will need to be removed once removed from the printer. Or in the case of our CJP printer, the models need to be depowered and infiltrated in order to attain the full strength and colour of the print. After this last stage the final printed models are ready to be sent to customer. Colour Jet Printing (CJP) technology produces high-resolution, true colour, realistic models and prototypes. 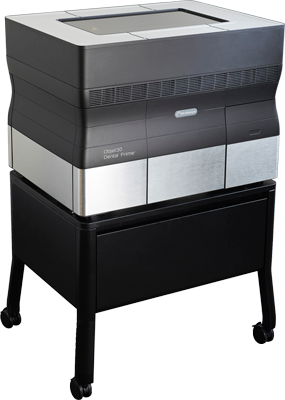 With an 8x10x8 inch build chamber, and packing 300x450 DPI resolution, the Projet CJP 460plus is our most popular printer to use. ⚬Low cost per printed part. ⚬ColourBond infiltrate, which gives strength and colour vibrancy to a print. ⚬StrengthMax epoxy resin infiltrate, which dramatically increases the strength of a print and gives it a thick glossy finish. Featuring CMYK capabilities, this printer precisely creates the look, feel, and style of product designs, eliminating the need to use paint after to achieve a realistic effect. The printers multiple print heads means the best range of accurate and consistent colours, including gradients. CJP involves two main components; the core and the binder. Core materials, which is a fine white powder, is spread in thin layers over the build chamber with a roller. After each layer is spread, colour binder is selectively jetted from inkjet print heads over the core layer, causing the core to solidify. The build platform lowers with each subsequent layer of core and binder until the model is complete. After a drying period,the models is moved to a depowering chamber where excess core material is carefully removed with pressured air. It is now ready to be infiltrated and touched up as required. The finished model is now ready for shipping. 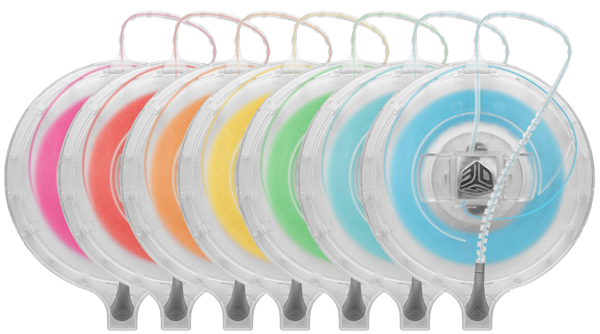 Colour Jet Printing technology enables models to be created within hours, not days. 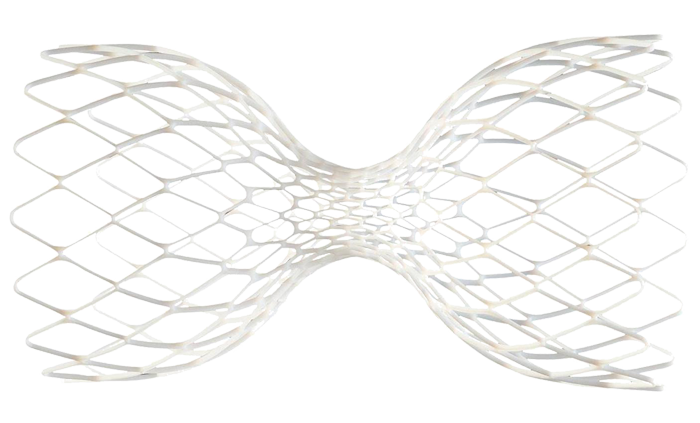 This high throughput allows for greater efficiency in the printing of larger models, or many multiple iterations of a model. The Projet CJP 460plus utilises an innovative material recycling process, so you only pay for the exact amount of material necessary for the job and no more. After printing, unused core materials are recouped by the machine, ready to use again. This system, along with good 3D model preparation to minimise material requirements, allows us to keep our printing cost down as much as possible for you, our customers. 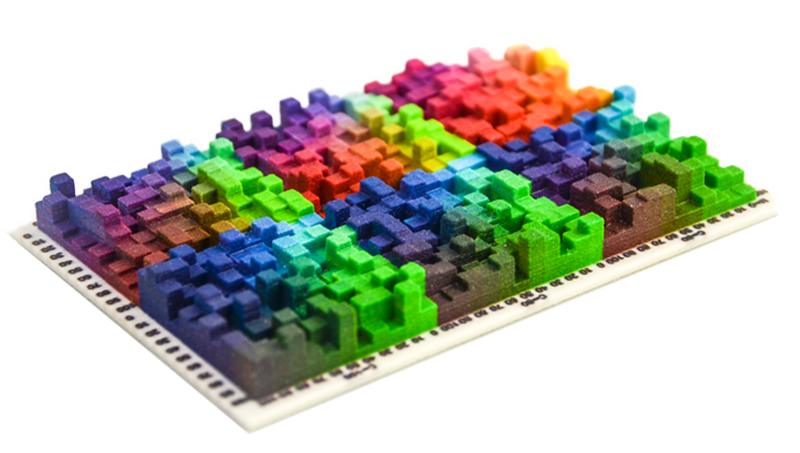 Choice of over 8 distinct 3D printing materials in many colour options. 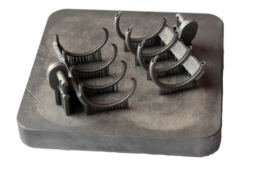 This includes rigid, tough, and durable plastics, capable of forming working parts such as hinges and snap-fit clips, as well as materials aimed at producing flexible or soft touch components. 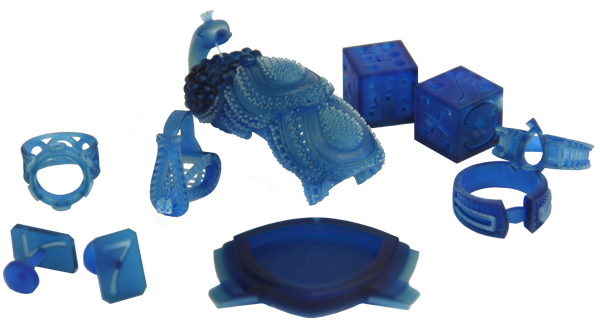 Create clear models with great dimensional stability, or even parts that are bio-compatible. Featuring PolyJet™ technology, this printer is ideally suited for consumer product prototyping, precision tooling and specialised production parts. With outstanding productivity, it can quickly create delicate and complex models, in a wide range of material options. The printing process works similarly to an inkjet paper printer, except instead of ink, the print head jets layer of liquid photopolymer onto a build tray, where it is instantly cured by UV light. Many of these fine layers build up to create a prototype or production part. 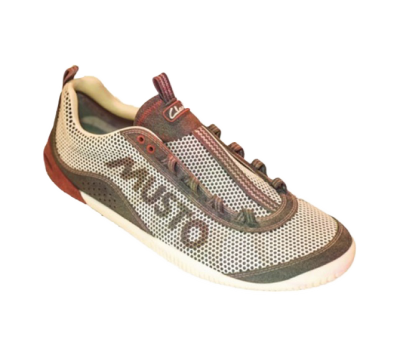 As well as the chosen model material, a gel-like, non-toxic support material is also printed. This is easily removed after printing with water jets, minimising the post-printing processing time required. 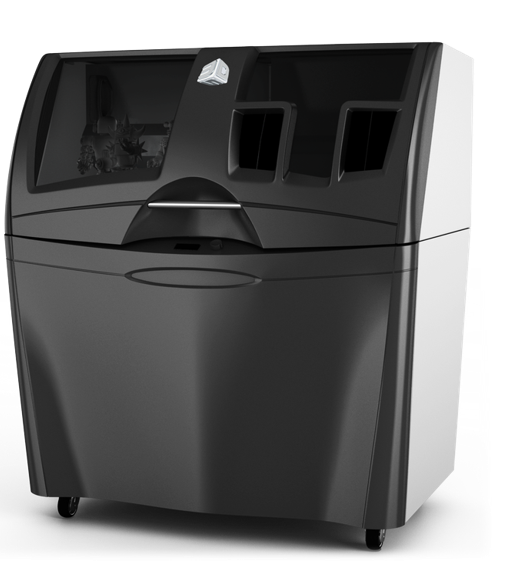 With exceptional resolution and fast print times, 3D Systems ProJet 3500 HDMax is an excellent choice for creating durable, high definition functional prototypes, rapid tooling such as injection molding and casting patterns, and end user parts. 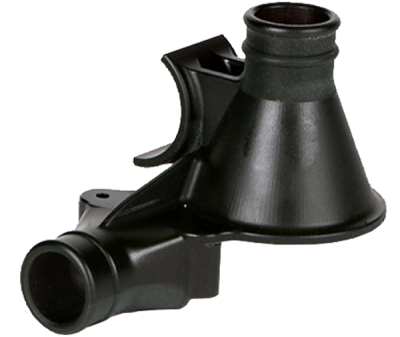 Uses VisiJet M3 performance engineered material, a hard ABS-like plastic, available in a variety of colours, tensile strength, and other properties to suit a range of needs. 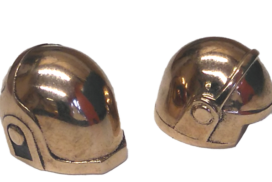 Available features include biomedical compatibility , high temperature resistance, water-tightness, castability, durability, and many more. Printed parts can be painted, glued, drilled, plated, etc. 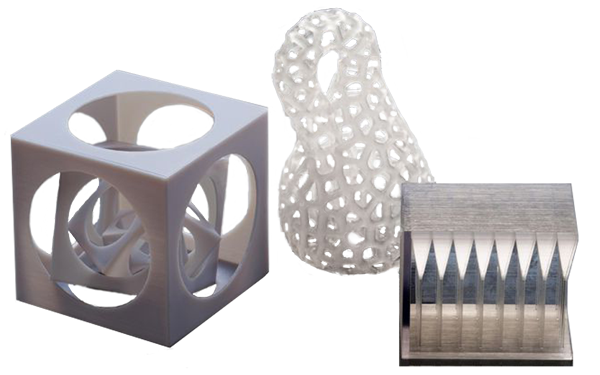 Utilises 3D Systems' MultiJet Printing Technology (MJP), a process similar to the Stratasy's PolyJet priting, where uv curable materials are deposited in thin layer to build up the model. Features a variety of printing modes, such as the high-speed mode, for larger prints where speed of production is priority over achieving maximum resolution. This selection of printing modes means that the highest detail for your requirments is reached in as short a time as possible. 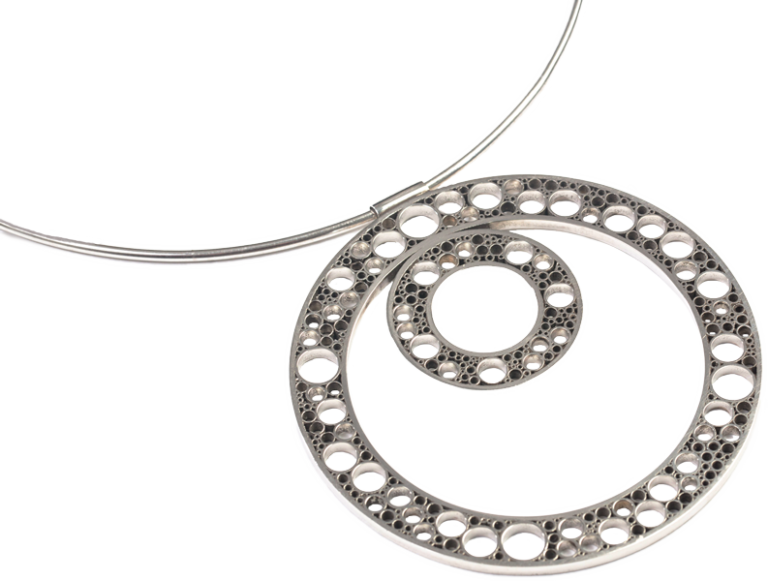 The machine is capable of printing in stainless steel 316, bronze, sterling silver and even gold! Needless to say, we can only print gold where the material is supplied to us for obvious cost reasons. The silver is both purer and more tarnish retardant than that which you can buy at any retail jewellers. 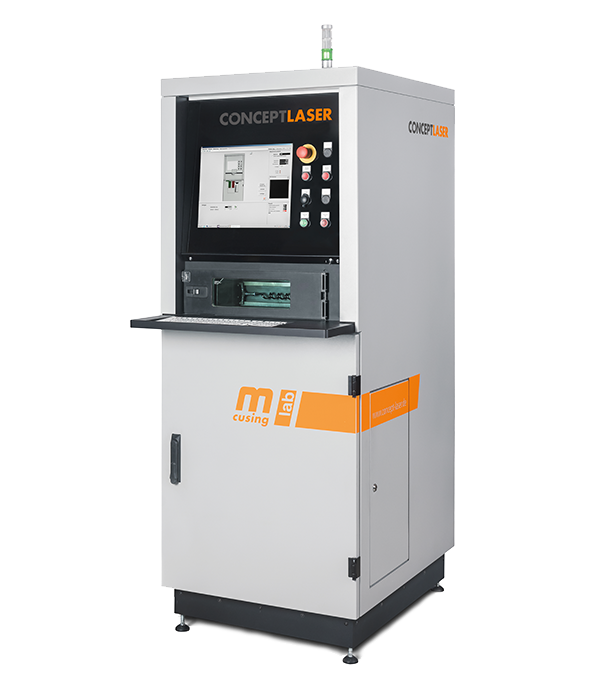 The laser beam resolution of the Mlab is identical to the laser beam resolution of 3D printers and wax plotters which are currently available on the market. The ideal machine for manufacturing metal components with elaborate structures. 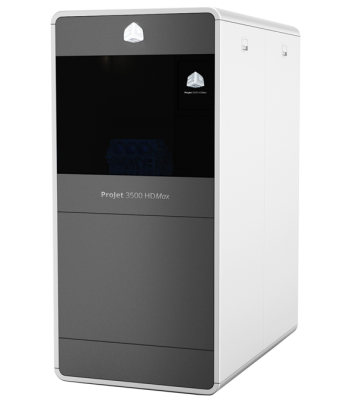 This system can produce denser objects with superior surface finish compared to other metal printers. Traditional metal printers use a binding agent, such as a wax or plastic, even sometimes just as a support, this weakens the final structure. It can leave gaps between layers and therefore cavities or holes, making the part porous and even brittle. 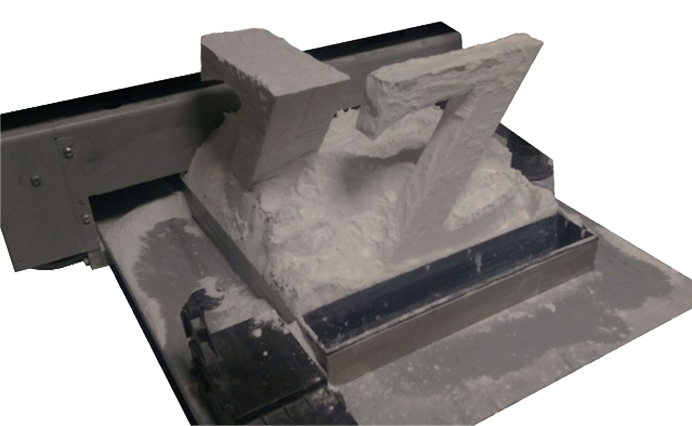 The Mlab fully melts metal powder to create more dense components with a strength comparable to forged steel. It is perfect when the finest component structures are what really matter! 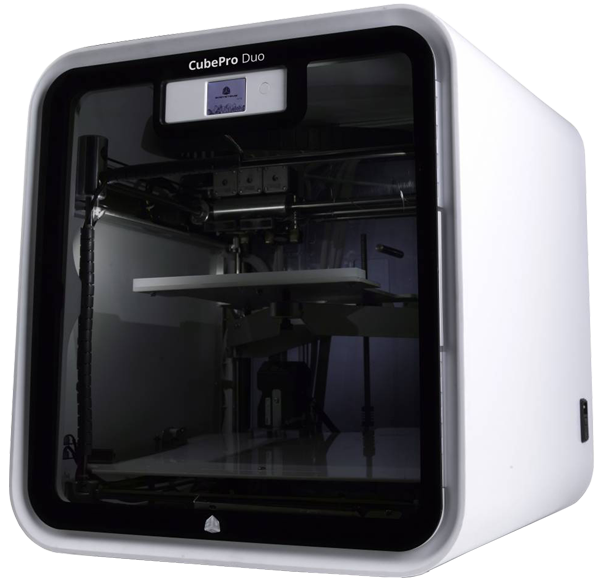 Utilising Plastic Jet Printing™(PJP), 3D Systems' own FFF (fused filament fabrication) technology, the Cube Pro Duo is aimed at those who are looking for a lower cost 3D printing option, while still getting the best quality available at this spec range. Plastic Jet Printing is a method of rapid prototyping, which extrudes melted build material in layers to create a model. The printer consists of a build platform, extrusion nozzle, and a control system. Printed parts sometime require integrated supports to hold up overhanging section. These are cut or melted off once removed from the printer. The Cube Duo can print in ABS or PLA; stiff, durable plastics that are available in a wide choice of colours of colours, of which up to two at a time can be used for printing. Resolution: 0.100mm (0.004" / 100 microns) x axis. Accuracy: X and Y axis ± 1% dimension or ± 0.2mm (0.008"/ 200 microns) whichever is greater. Z axis ± half the processed z resolution. Minimum Layer Thickness: Horizontal build layers as fine as 70 microns.